Being a mother of three boys and a girl, I have spent many hours watching their various activities. All three of our boys love soccer, and until we moved to Louisiana, we were very much involved with the sport. Sadly, soccer is not very popular here in Louisiana, and so they have not been able to be involved much. In addition to our boys playing soccer, our oldest son, Miles wrestled in high school. Miles also did some karate for several years. Our middle son, Scott played some football, cross country, tennis, and A LOT of baseball. Since he had a very bad knee injury a couple of years ago, he has not been able to play. Boy, do I miss those nice warm spring and summer days watching him play. Benjamin, o ur youngest has not only played soccer and football and done a little karate, but now has started being involved in track. He has just started competing in pole vault. Boy, does that look like a fun sport! Yesterday, the school sponsored a track meet, and so I went up there to take some pictures. For just starting out, Benjamin is actually pretty good! I really enjoyed watching them fly through the air. Benjamin is just a sophomore, so if keeps up the hard work, maybe by the time he is a senior, we will be headed to state. Keep up the hard work, Benjamin!!! For our Young Women's activity last night, we cooked a dinner for our missionaries. We met at one of the girl's homes and we went to cooking. First we made the main dish, which was Spaghetti Casserole. I got this recipe from a book my mom used when I was young. My mom passed the book down to me, as it is now out of print...for obvious reasons. The book is called, "How I Feed My Family On $16 A Week (And Have Meet, Fish or Poultry on the Table Every Night)" by Jo Ann York. Cook spaghetti according to pkg directions, drain and set aside. Brown beef drain and set aside. Heat oil in a 1 1/2 qt oven casserole. Saute, covered the onion, garlic, green pepper and mushrooms, til soft. Add pepper sugar, Worcestershire, oregano, parsley flakes, tomato sauce and cheese. Cook, stirring over a low flame til cheese melts. Add cooked spaghetti and browned beef and mix well. Bake, covered for 30 mins. After it was made, we divided into two containers (since we have two sets of missionaries). I just bought a bagged Caesar salad kit to go with the spaghetti. The next task was dessert. I have a recipe that my grandmother use to make all the time. I now make it A LOT! The ingredients can always be on hand, and it is really quite simple, and EVERYONE loves, LOVEs this! Heat 1 cup kayro syrup and 1 cup sugar til sugar is dissolved. Remove from burner and add 1 cup peanut butter and mix well. Add 6 cups krispie rice cereal. Press into cake pan. In microwave, heat about a cup of chocolate chips and about 1 cup butterscotch chips in the microwave in 30 second intervals until melted. Spread onto the top of the cereal mix. We all had a really fun time with this activity. The girls have been wanting to do more service activities, and this was a fun service for them to do, plus they were able to learn some cooking skills and obtain some new recipes. After the garage sale a few weeks ago, one of my walking buddies had some left over stuff that she was going to take to Goodwill. She called me to see if maybe there was anything I would like to have. I went over to her place, and she loaded me up with a few things, one being this end table. I took it home and started to work on it. I did a little investigating, as this table was a high laminate. There was no way I was going to be able to sand anything. After my research, I found a primer that says no sanding is needed. I decided to give it a try. After priming, I painted it white all over. After it dried, I put a couple of very light blue coats on the top. All I need to to is spray some polyurethane on it. I actually like the way it turned out. I am curious to see how it will hold up once I give it a few coats of the polyurethane and let it dry. William and Terry Carter would like to announce the engagement of their daughter, Ashley Jeanette to Jeremy Luke McCullough, son of John and Jere McCullough of Muncie, IN. Ashley is scheduled to graduate in June from Brigham Young University in Provo Utah with a Bachelor’s Degree in Dance. Jeremy will be continuing his education at the University of Louisiana, Monroe and majoring in Kinesiology. 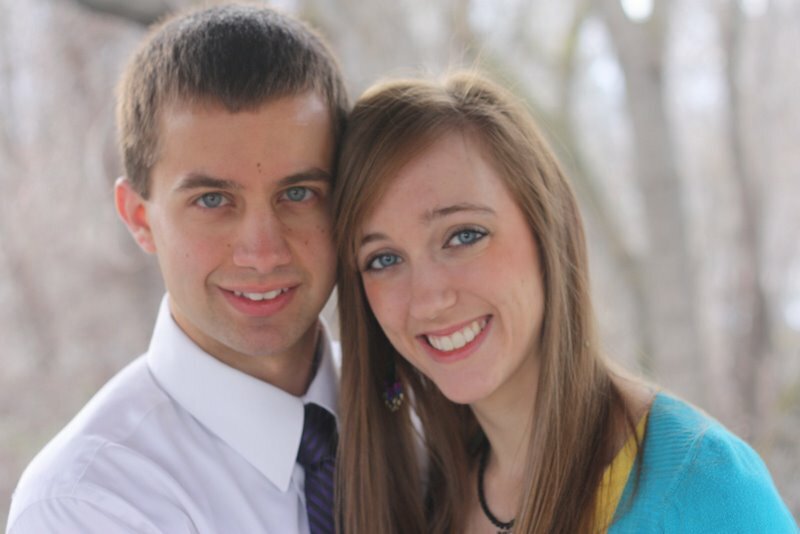 The couple will marry Wednesday, 29 June at the LDS Washington DC Temple. Two receptions will follow, one in Muncie, IN and the other in Monroe, LA. A couple of weeks ago, I went to our neighborhood garage sale. I was lucky enough to find many nice things, including four dining room chairs. I love the looks of them, and they are real comfortable. The only thing is, the seats are kinda yucky, but no problem, I can put new coverings on them. These chairs are for my daughter and her fiance that are getting married this summer, and so I asked her what color she would like. I know they are going with blues and yellows in the kitchen, and she said she thought a green type fabric would be nice on the seats of these chairs. There are so many shades of greens, and she said she likes the green that is on our living room couches. So, it was off to the fabric store I went. There aren't very many fabric stores in our area, but we do have a really nice drapery and upholstery fabric place. I wasn't sure if they would be too out of our price range, but know a lot of the times, these places have really good mark downs and scrap bins. I thought maybe I could find four different pieces that complimented each other if I couldn't find enough of one fabric for all four chairs. I was right, they did have some nice mark down fabric, and I went digging around, I came across this beautiful piece of material. It matches our couches perfectly, and has little yellow, blue, pink and white flowers on it. I fell in love, and knew Ashley would like it too. So, I brought it home. Here is the finished product. Now, don't look too close, as in the middle of stapling the fabric onto the chair, I ran out of stables, so one side is not tucked in very well. I can't wait to stock up on more staples and finishing these four chairs. They look as good as new, and I spent less that $35 for ALL four chairs. Last week, my husband went to Tennessee to visit with his family, and turkey hunt. He was able to visit not only with his mom and dad, but with our oldest son who lives near my in laws. Whenever he is gone, I get zero sleep. It has always been that way, I just cannot sleep while he is gone. I kept very busy while he was gone. There is so much going on right now. In addition to all that is going on in the family, I know quite a few either getting married or having babies. I always like to bring unique gifts to showers. Most of the time, I crochet baby blankets (for those having babies), but with my thumb acting up, there was no way that my hands were going to cooperate for that length of time. So, I had to come up with something else. Off to youtube! I saw some really cool things I wanted to try. For a bridal shower that I will be attending soon, I decided to make a towel cake. One can never have enough towels, but I sometimes think they are kinda a boring gift. Not if you give it this way...and it was quite simple, and inexpensive. It takes two big towels, two hand towels and two washcloths. Just roll them up, add ribbons, flowers, or other embellishments, and you are good to go. For this gift, I added one of my handmade Fleur de les necklaces. I have another shower to go to...a baby shower. While I was looking up creative shower gifts, I found how to make flowers out of baby socks and baby washcloths. They really made it look simple, but I will have to be honest with you...it was not. I might be doing the towel cake again, but not the baby items bouquet of flowers. The problem I was having was, the floral tape did not want to stick to itself. I'm not sure why, as I bought it new (I've worked with floral tape before and never had this problem), I'm sure it was probably the nut behind the wheel (me). I am pretty satisfied on how it turned out. I really had planned on doing more flowers, but I won't be. Instead, I will just give her the rest of the socks and washcloths. You should really go to Lori Anerson's blog and check this out. 7000 Bracelets for Hope. "To join the hop, you need to make ONE bracelet in an adult size in a denim/blue jeans-inspired theme. Basically, any blue bead will do! The bracelets will be sent to The Global Genes Project, an advocacy group who launched "7000 Bracelets for Hope", a children's rare disease campaign. The bracelets are given to one of 7000 families having children with rare diseases to show them love and support." I am really disappointed that I will not be involved with this blog hop. I have been having problems with my thumb for the last couple of months, and I am finally breaking down and going to the doctor. I have a feeling that he is going to give me a cortisone shot and put me in a little brace and tell me to rest it. I went through this right after I had my 4th child. I guess I should thank my lucky starts that it has taken over 16 years to flair back up. Anyway, this looks like a really good cause. This is a bit close to my heart for several reasons. One being, that just two months ago, we lost a good friend to Dock 8 which is very rare. Only a hand full of people have this in the world, and she was the oldest living survivor. She was just 22 when she lost her battle. Her younger sister is now fighting the same battle. You can read up about it on their family's blog. You will be truly inspired by Kelsey and Karly's story. The second reason this is so dear to me, is that my sister has two very sweat boys with autism. Granted, autism is not that rare anymore, but I know that these families go through so much, and a word or two of encouragement is something that they need. Today was the big garage sale day in our neighborhood. I did some pre shopping yesterday and got a few things. Today, though was the main shopping day. It was suppose to start at 8, but everyone was out and shopping at 6:30. My poor husband had to work, and left about 6:30 and could hardly get out of the subdivision. The first place Evelyn and I stopped, we saw some really nice dishes. A service for 4, and brand new too. I went ahead and got them, because they were blue and yellow...just the colors my daughter was wanting in her kitchen. Heck, if she doesn't want them...I do. I love them. Since the place was across the street from Evelyn's we decided to take them to her place so they wouldn't get broken before I could get them home. On to the next place, and next place, etc. The other things I picked up was a clock for $1 (for our Young Women's room), a spice rack, and a pillow. One place we stopped, Evelyn and I saw these cool snowman plates and mugs. They were $5 for the set. I really did not want the mugs, and Evelyn did not want the plates, so we asked if we could have the set for $4, and we split it, so I got snowman plates for $2, and they match my snowman cookie jar that I've had for years! One other thing I got that I was excited about was a paper towel holder. I've actually been in the market for one, and I found one for $1! The last thing I picked up was an end table. I really don't like the color (dark green), so I am going to paint it. Probably white, but not sure. All it needs is a lamp shade, or I may just take the lamp part out all together and it can just be a plain ole table. You really can't tell by this picture, but it has a magazine rack on the bottom. Several years ago, I was into painting chairs. I had gone to a restaurant, where all the chairs were painted in cool ways, and I just fell in love. After inspecting the chairs, I thought to myself, "I can do that!" and so I did. One can only have so many painted chairs, so I branched out, and found a coffee table at a garage sale for a good price. I decided to paint it, and this is what it turned out to look like. I love color, but at the same time, I like to have things I can use for many years, so I chose these colors. Terracotta and green which are pretty neutral. The colors I chose for the flowers are all different colors, so they will go with anything I may choose in the future. After painting, I put a semi gloss acrylic spray to protect the table. This weekend, our subdivision is having their annual garage sale. We have a very large subdivision, and people from all over the parish come to shop. It is always a very busy day, and if you are wanting in or out of the subdivision, you might want to give yourself another 30 minutes, or you will be late. This morning on our walk, we saw many already setting up and getting ready for the garage sale. One of the ladies I walk with invited me into her home to show what she had. I quickly fell in love with this cow. Now, I am not usually a cow fan, they are ok, but I don't gravitate to them like many of you do. I just fell in love with this one though, and guess what!? It was only $1. So I took it. It now sits nicely along side our piano. After I went home and cleaned up, I decided to drive around the neighborhood to see if anyone was setting up with something I might like. I wished I had of drove around before I went home after my walk, because one lady had a beautiful day bed---for $100!!! Exactly what I was looking for and the right price. Oh well. But she did have something I thought was pretty cool. A coffee table. It was a great price, so I bought it. I would like to paint it, but it is veneer. She had already sanded the sides up, because that is what she had planned to do, but then decided not to. So, now, I need to figure out how to paint it. I would love to paint the top white and the legs either a light blue or light green. The only problem is, since it is a heavy veneer, I'm not sure if I can paint the top. I need to sand, but it will take quite a bit of sanding, and I'm afraid that the sanding will go too far, and then I might ruin the table. So, does anyone have any ideas or experience in this? If so, I would love to hear your thoughts. I called our local hardware store, and they told me that I could just prime it and it would be fine, I question that, because the top is so slick. I'm not sure that the paint would adhere to the table, and it would just peel off. And, like I said not sure I can actually sand it, because it is such a high gloss.